I met Cori McCarthy at my local coffee shop this past July and it has been so much fun talking to her about YA and writing and her new book, The Color of Rain! The Color of Rain will be out next May and I am thrilled to be able to reveal the cover today! "If there is one thing that seventeen-year-old Rain knows and knows well, it is survival. Caring for her little brother, Walker, who is "Touched," and losing the rest of her family to the same disease, Rain has long had to fend for herself on the bleak, dangerous streets of Earth City. When she looks to the stars, Rain sees escape and the only possible cure for Walker. And when a darkly handsome and mysterious captain named Johnny offers her passage to the Edge, Rain immediately boards his spaceship. Her only price: her "willingness." The Void cloaks many secrets, and Rain quickly discovers that Johnny's ship serves as host for an underground slave trade for the Touched . . . and a prostitution ring for Johnny's girls. 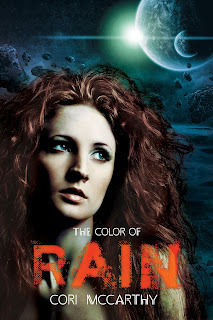 With hair as red as the bracelet that indicates her status on the ship, the feeling of being a marked target is not helpful in Rain's quest to escape. Even worse, Rain is unsure if she will be able to pay the costs of love, family, hope, and self-preservation." I am so excited for this book! If you're a fan of YA, science fiction, or the new "new adult" genre, this will be a book for you! And feel free to tweet, share, and re-blog! Spread the word about this awesome cover and book! If you do share, let me know in the comments (and include the link) and I'll send you an envelope of book swag! The cover looks really cool, almost like a comic book's.